1967. 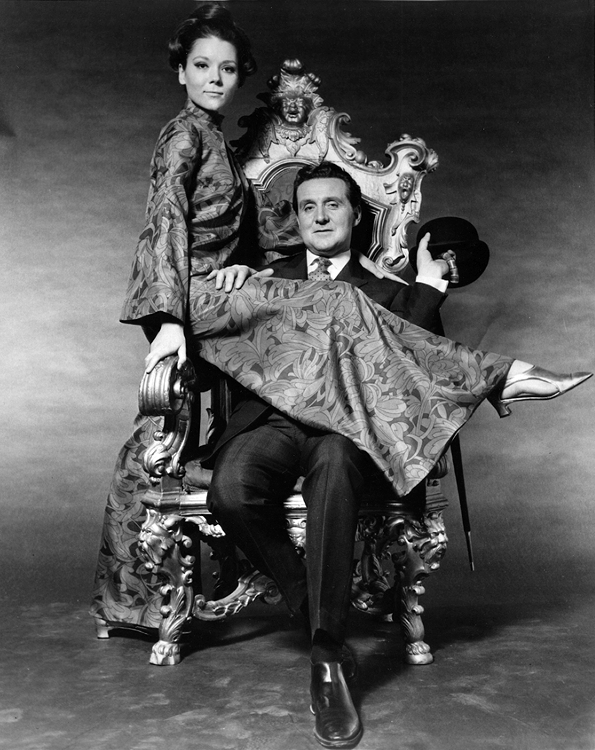 Seated on the baroque throne is Patrick Macnee as suave, unflappable, debonair secret agent John Steed. His wardrobe is inspired by that of Patrick’s father, a racehorse trainer. But it was his mother who brought up the young actor, instructing him to call the wealthy lesbian with whom she had absconded “Uncle Evelyn.” He made his film debut in The Life and Death of Colonel Blimp (1943). With one leg across Steed’s lap is his partner, Emma Peel, played by Diana Rigg. Her character’s name started out as a brief for the role – M-Appeal, or man appeal. Mrs Peel (as Steed always calls her) is an ultimate sixties babe – kittenish, sassy, independent and with a cool line in skin-tight cat-suits. Diana is not just a pretty face, she’s a serious actress who will go on to be the leading lady at both the Royal Shakespeare Company and the National Theatre. Together, Steed and Peel are The Avengers, outwitting and outfighting evil masterminds in a tongue-in-cheek British TV series, which mixes the surreal with the camp. Mrs Peel is actually the second of three beautiful assistants (her predecessor is played by Honor Blackman, her successor by Linda Thorson) with whom Steed works over the course of the series, which runs from 1961 to 1969.